Our last step and thus our last tutorial! Not everyone will agree with me, but I really love this final stage of making a quilt. It feels very relaxing to me after the intensity of some of the previous steps. The first step is to choose your fabric. I usually don’t make my final fabric choice until the very last minute. 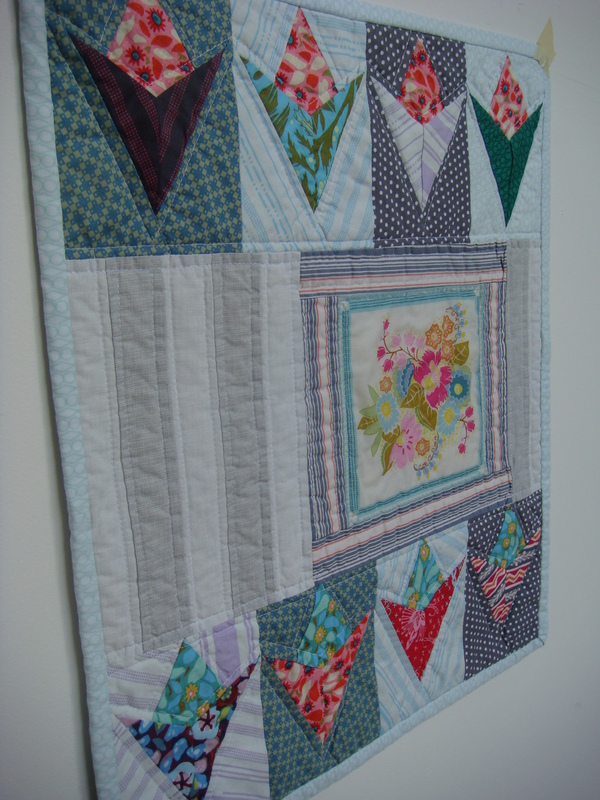 I often like to use binding to create a playful contrast to the rest of the quilt. 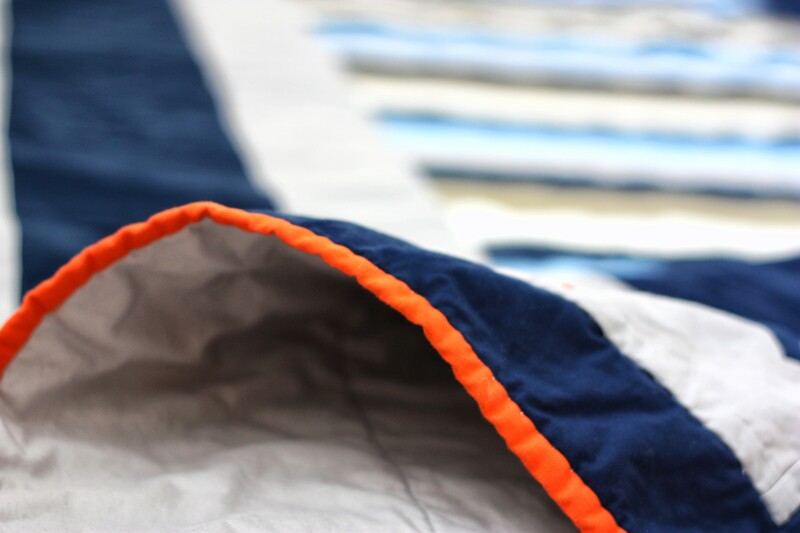 There wasn’t any orange in this quilt but I used orange binding to make an otherwise serious quilt a little more fun. On the other hand, for this one I simply picked one of the fabrics from the quilt itself. Choosing the dark fabric created a frame effect. 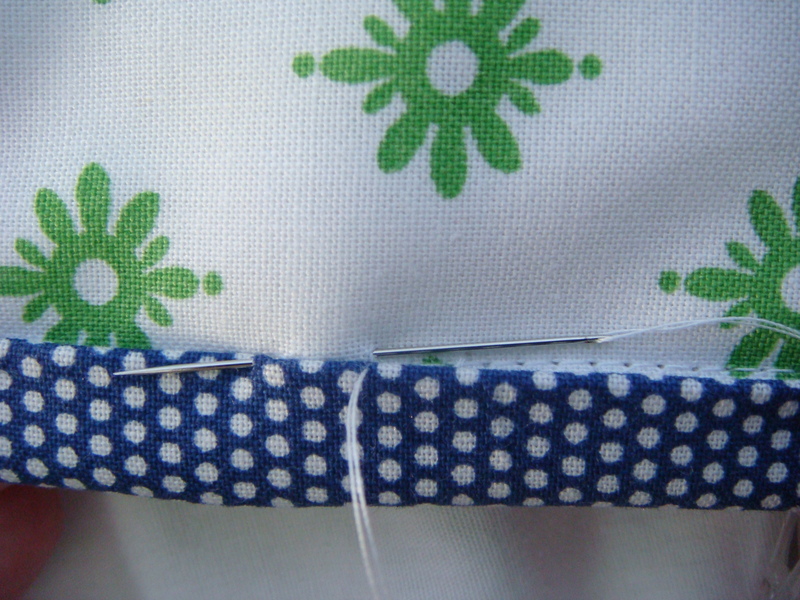 Small polka dots and stripes are commonly used for binding and almost always look great. 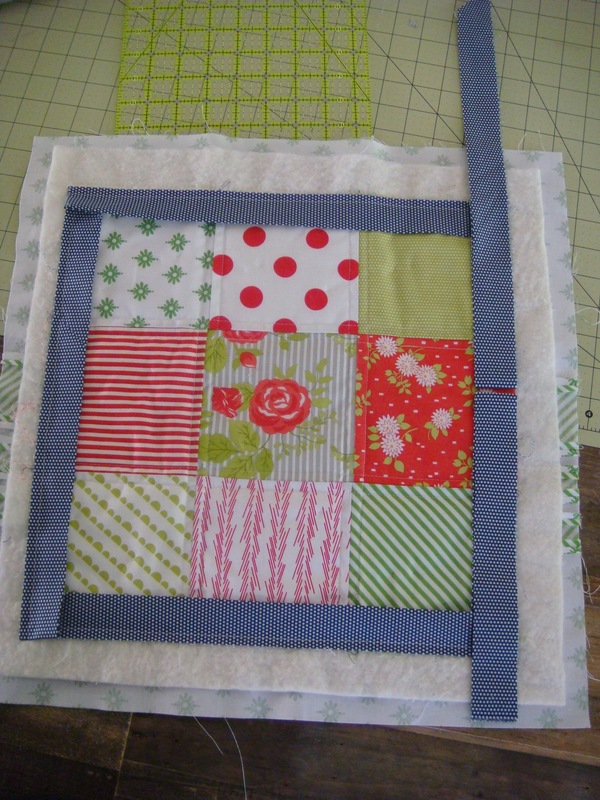 You can also create a scrappy binding of multiple fabrics. 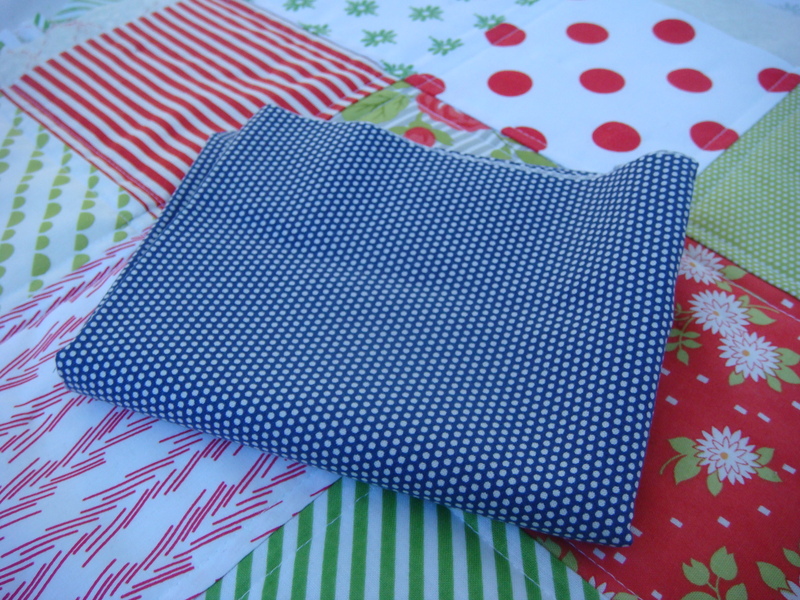 I’m going to use a tiny polka dot navy fabric for this mini. I know it doesn’t really match at all but I like that. Once you’ve chosen your fabric(s) you have to do a little math. 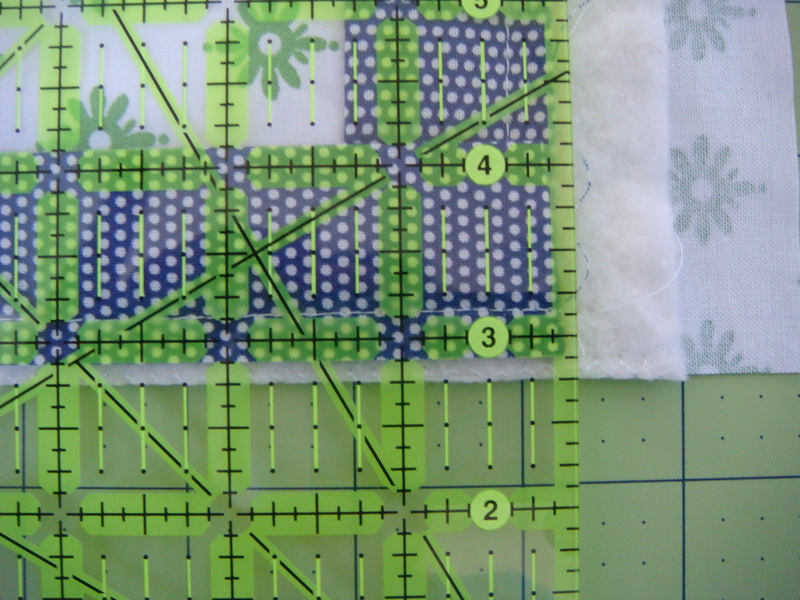 Measure all 4 sides of your quilt. Now add about 15 inches to account for areas where the binding will need to be joined. My quilt is 14 inches square. 14 x 4 = 56 + 15 = 71. 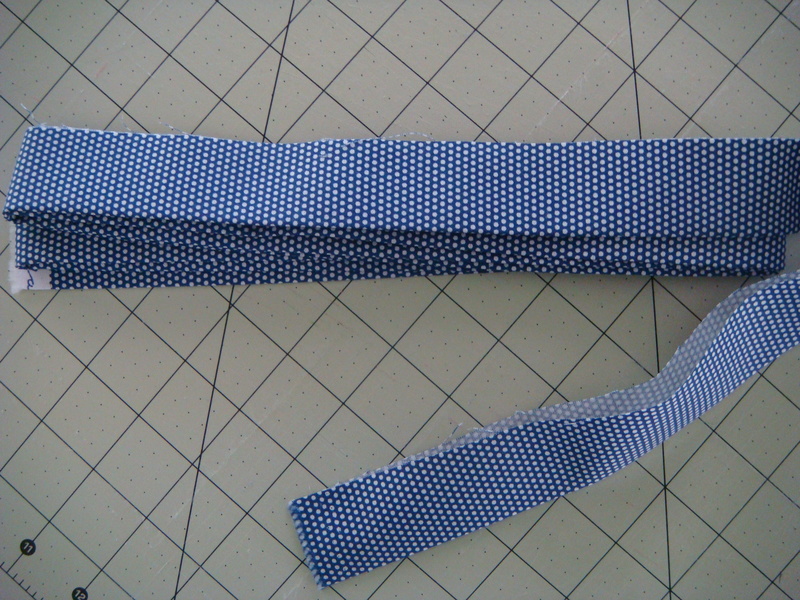 Cut enough 2 1/2 inch strips to make your binding. 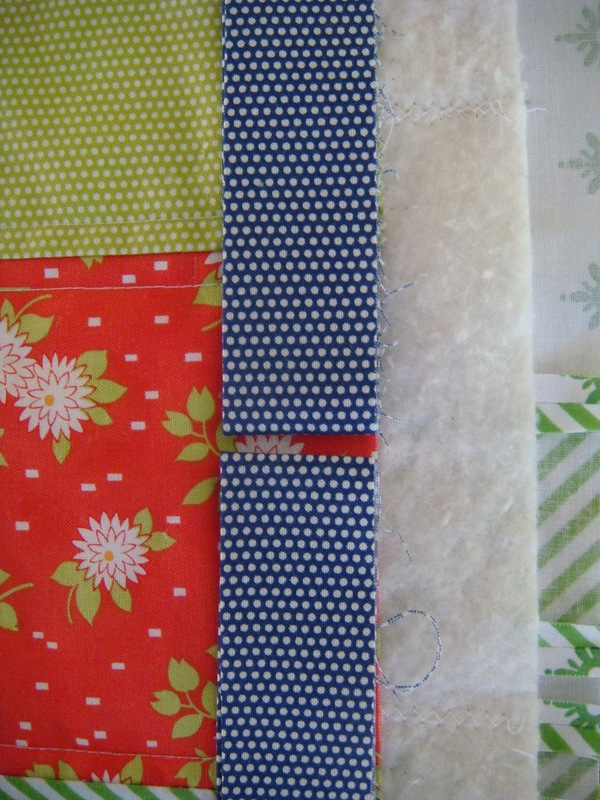 I’m cutting from yardage so I know I will need 2 WOF (width of fabric) strips. That will give me a little extra but that’s just fine. You can join your strips by simply putting them right sides together as always, or you can get a little fancy and use diagonal seams to make your binding lay flatter. If you just join right sides together there will be a little bump at every seam. Not a big deal really but in case you’re a perfectionist I’ll demonstrate a diagonal seam for you. 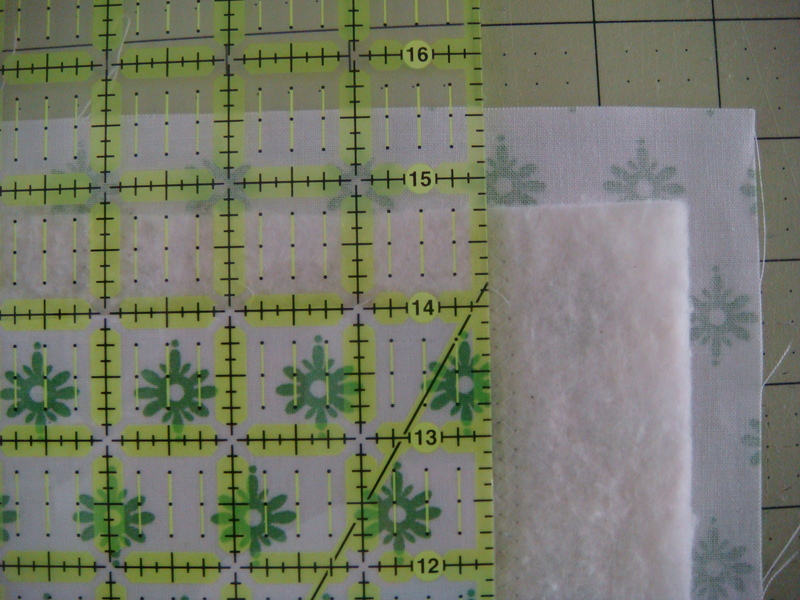 Line up the 45 degree line of your ruler with the bottom edge of your fabric. Draw a line with disappearing ink or a mechanical pencil. Pin the pieces together as shown and sew on the line. 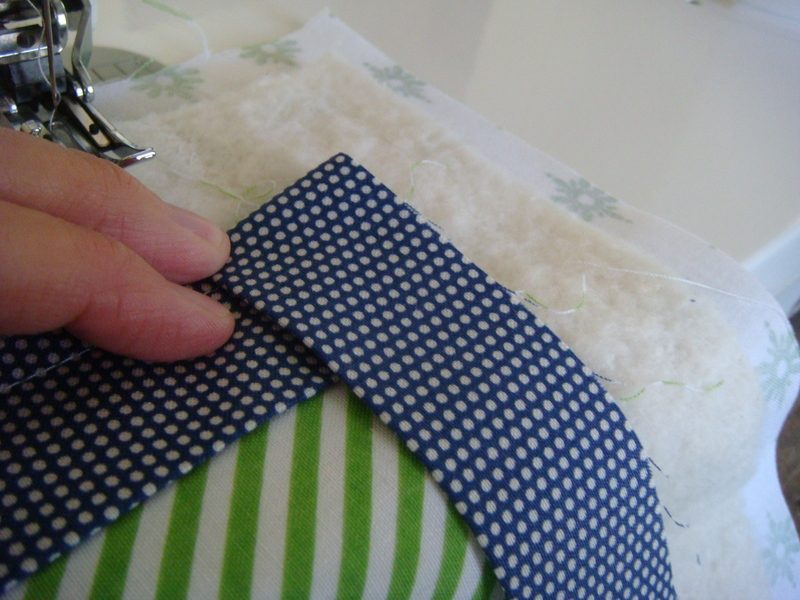 Trim and press your fancy diagonal seam. Pressing it open will make it lay even flatter. Now take your connected strips to the ironing board. Fold the binding in half along the entire length and iron it. When your binding looks like this you’re ready to sew. Leaving about 12 inches free, match up the raw edges and start sewing the binding to the quilt with a 1/4 inch seam allowance. 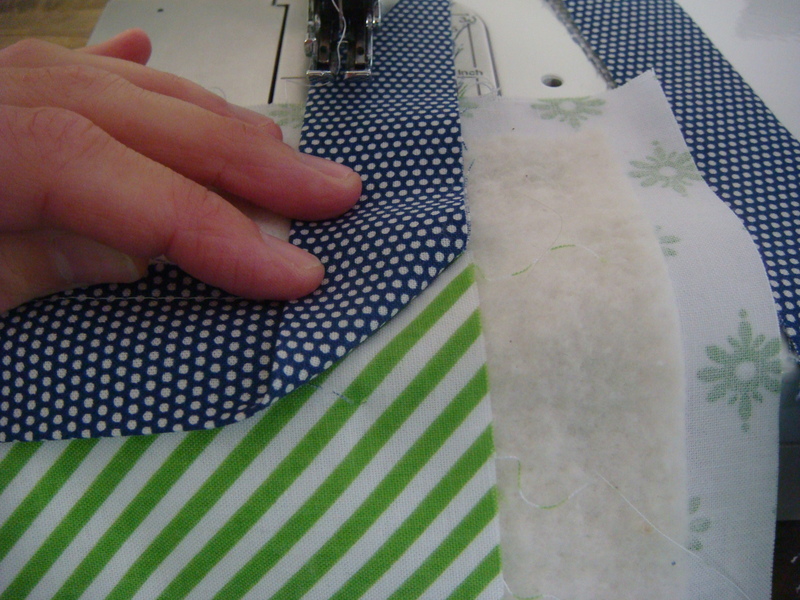 If you still have your walking foot attached from quilting that will help feed all the layers evenly. 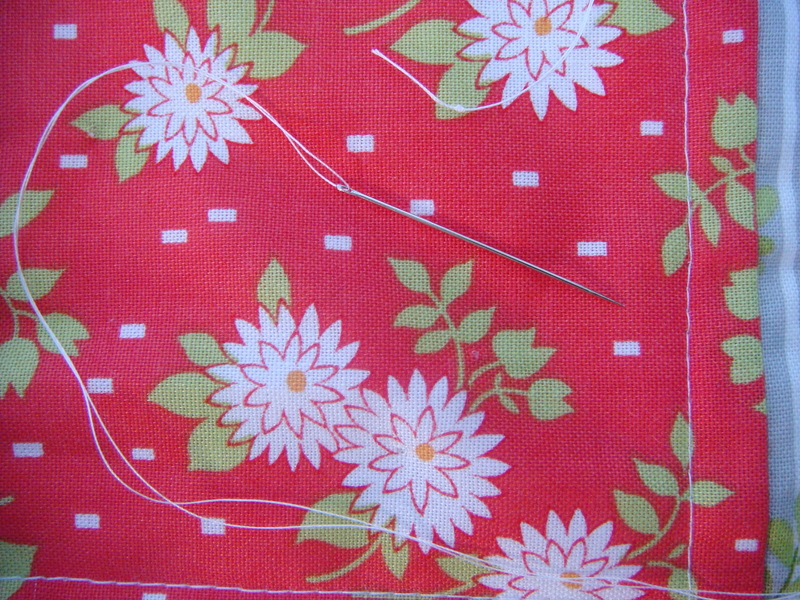 This is one time in quilting that you do want to backstitch at the beginning and end to secure your seam. 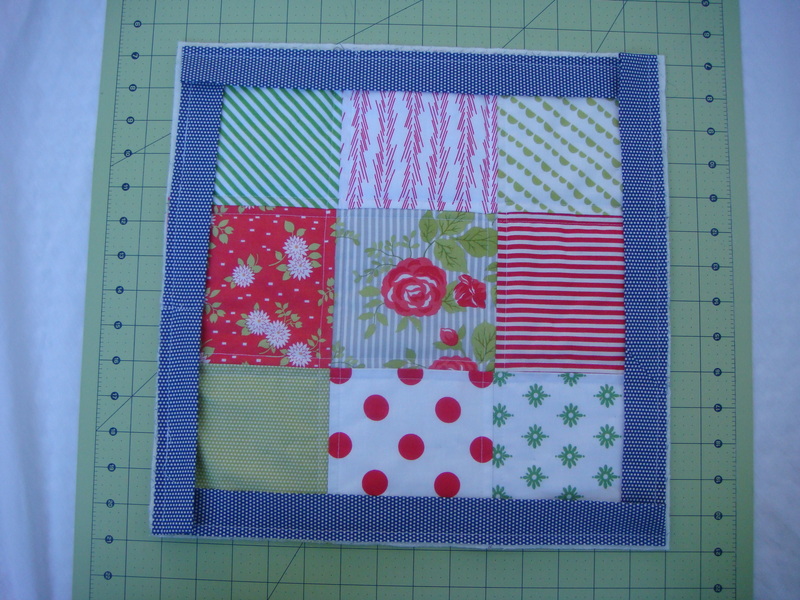 Stop when you get 1/4 inch from the first corner, backstitch and remove the quilt from the sewing machine. Rotate the quilt so the next side is in sewing position. Pull the binding straight back and then fold it forward to create a mitered corner. Now we need to connect the 2 ends of the binding. I’ll admit that I get pretty confused at this step if I try to do a diagonal seam here. I usually allow this to be the quilt’s one seam allowance bump. Someday I’m sure I’ll put my mind to conquering it. 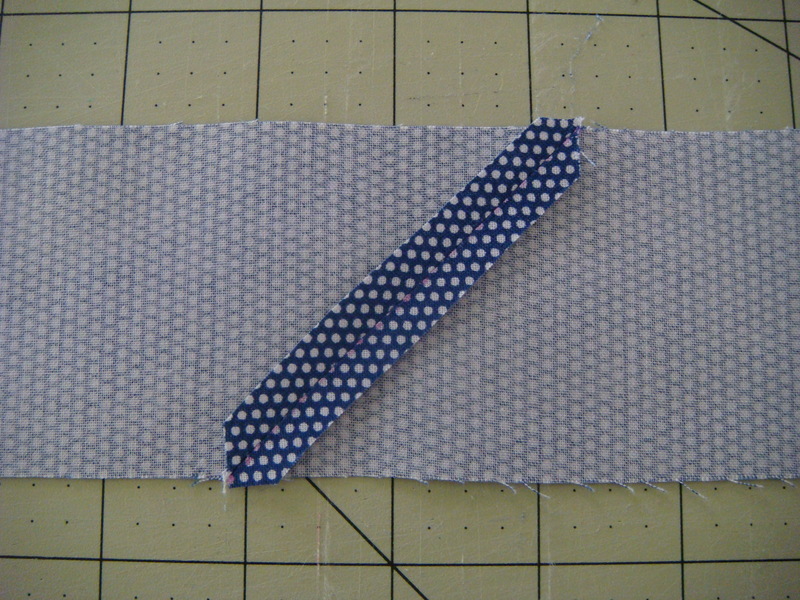 Fold the binding back at the midpoint of your unsewn section. 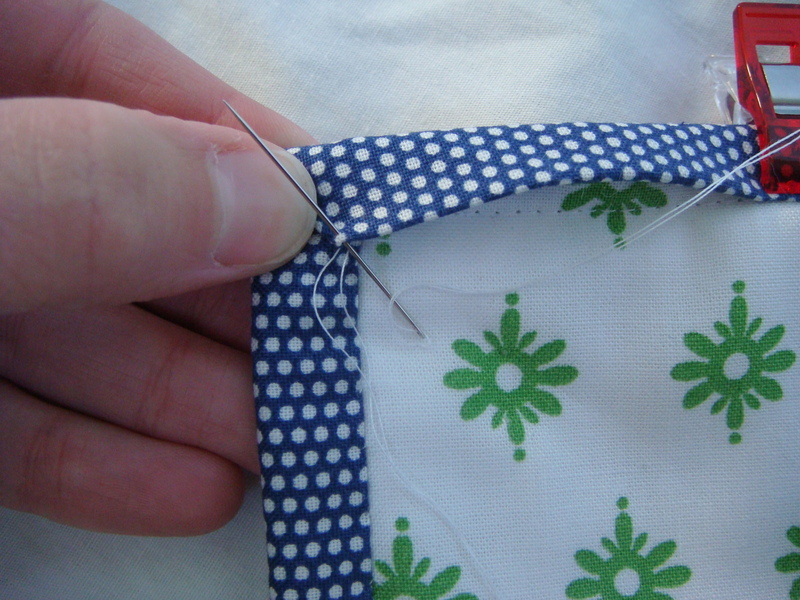 Fold the other side in a similar manner, leaving 1/4 inch space in between. Finger press a crease into the binding at these points. 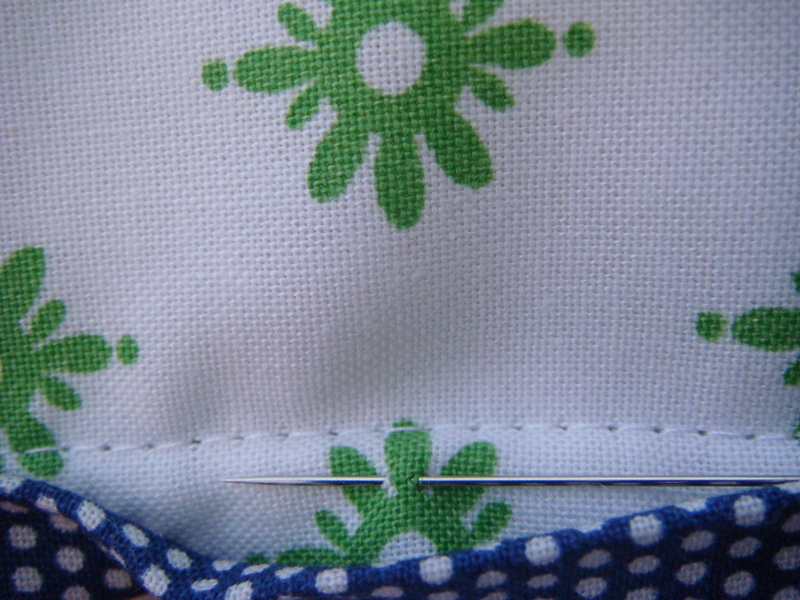 Put your two loose ends right sides together and stitch along the crease you just made. Trim the extra off and sew the remaining binding onto the quilt. Now that the binding is attached to the front of your quilt, you will turn the binding and hand stitch it to the back of the quilt. 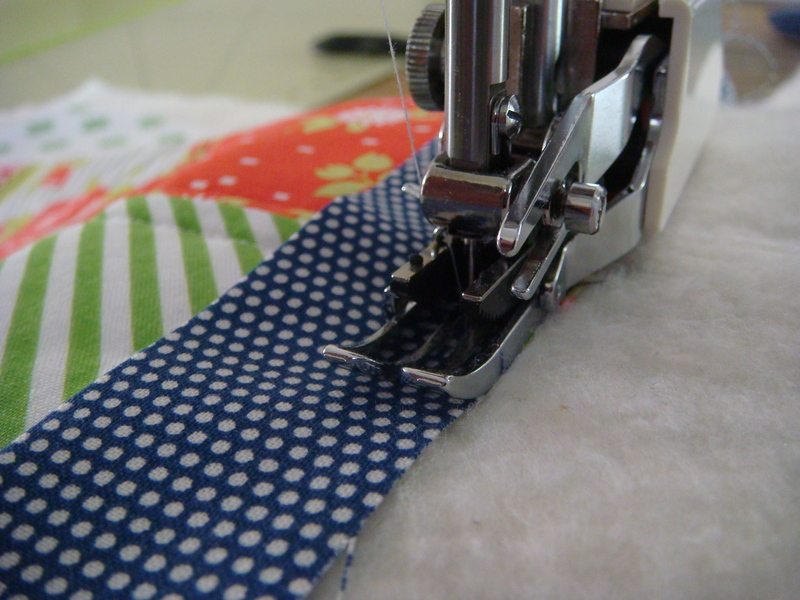 If you cannot stand the idea of hand sewing, there are some good tutorials on using a machine for this step. I’d try this or this. Before we can stitch the binding closed we need to trim the edges of our quilt. You should leave just about 1/8 of an inch to fill the binding and make it puffy. Be careful with the edges and especially the corners. 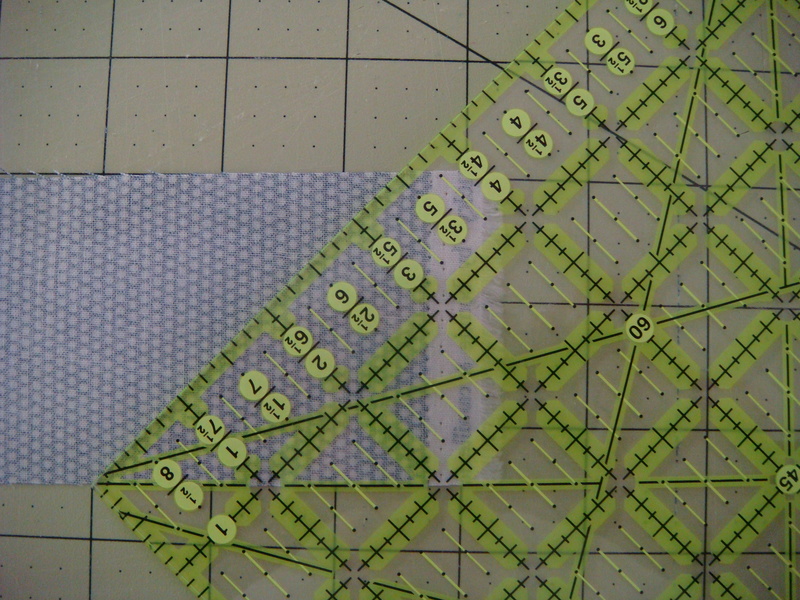 The lines you are cutting now will determine the straightness and squareness of your quilt. 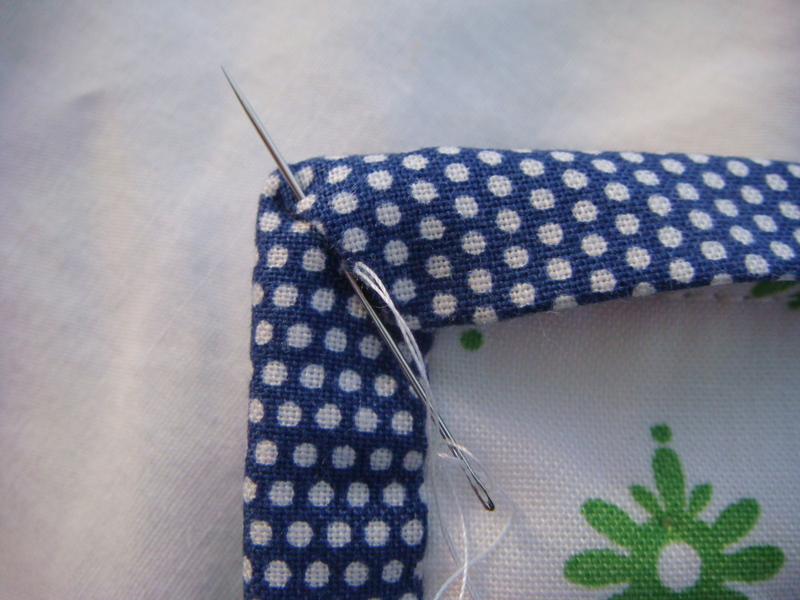 It is a good idea to double your thread to make the binding stitches more durable. When you thread your needle, it’s easier to keep the needle still in one hand and bring the thread through the eye rather than trying to move the eye over the thread. Make a knot. Take one stitch to hide the knot. 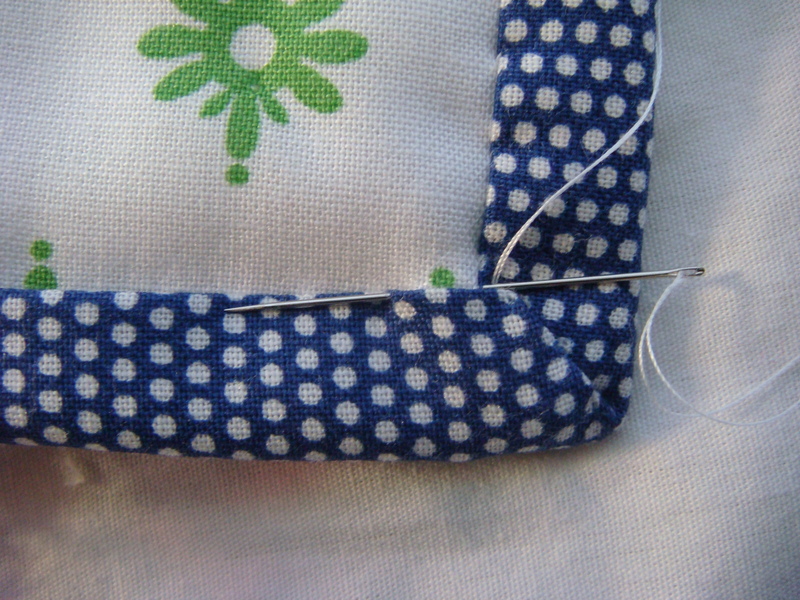 Then come up and take a stitch right where the thread comes up just at the very edge of the binding. The stitches are meant to disappear. 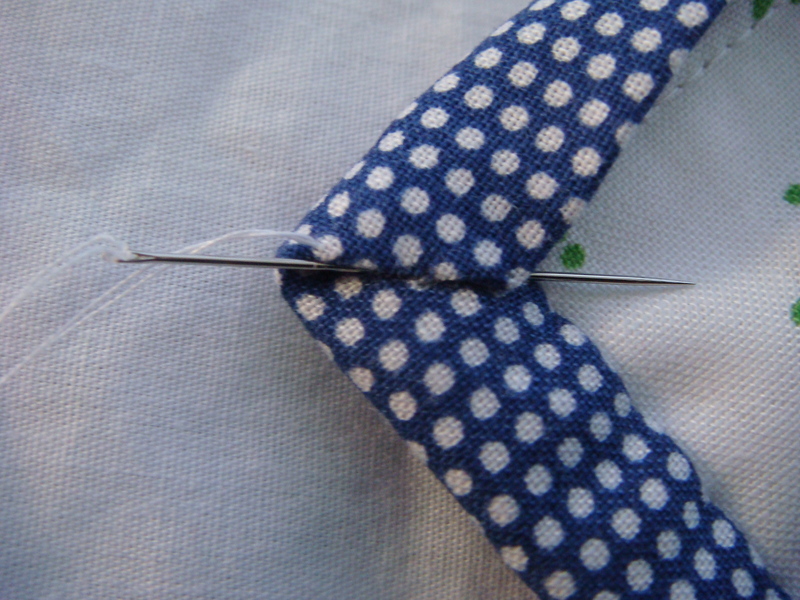 This is called a blindstitch. Be sure to check the front once in a while and make sure your stitches aren’t coming through on the front of the quilt top. 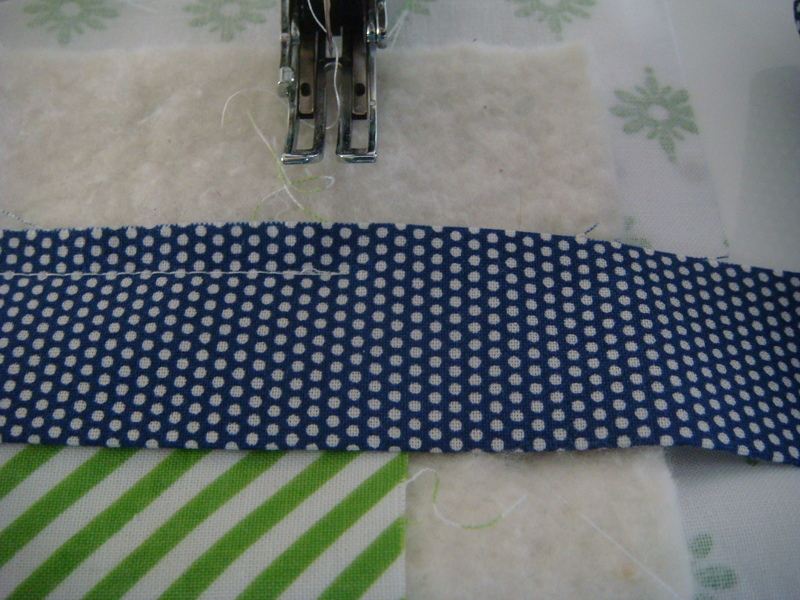 The way you sewed the binding onto your quilt at the corners should automatically create a mitered corner for you. 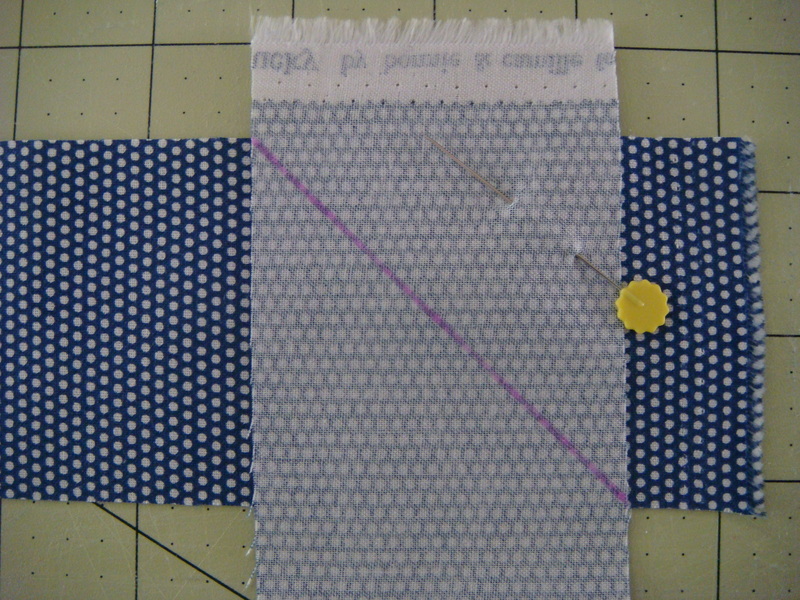 Take a stitch right at the corner and then continue up the edge with a blindstitch as before. 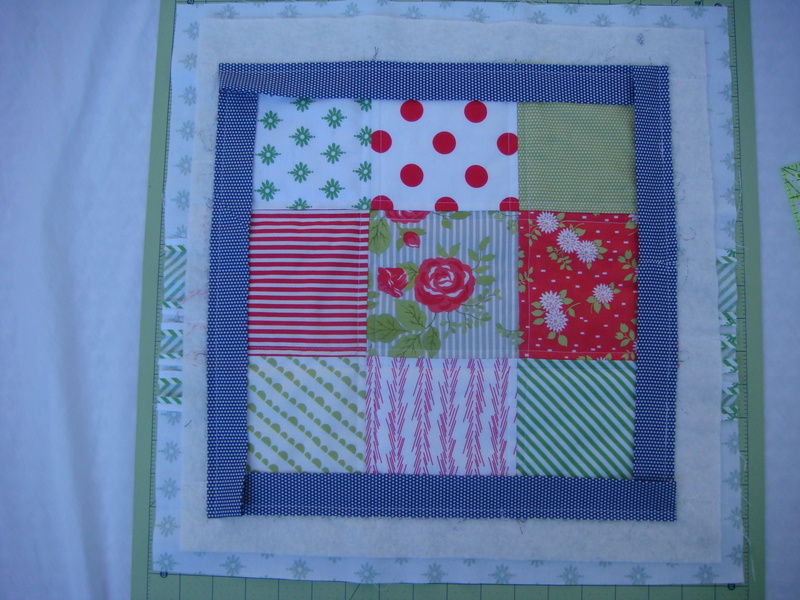 Bring the needle back through the corner and continue stitching around the rest of the quilt. I very much hope you’ve enjoyed this series and can see how fun and satisfying and not scary quilting can be! Please remember that no one else is going to see the imperfections that you see. Perfection isn’t really the goal. The goal is to relax and enjoy yourself and end up with something beautifully handmade with love. When I walk by the dining room table at night, after a long day of wiping the same butts and the same spots on the floor as the day before, I get tremendous satisfaction from seeing what I created that day. I hope you will too. 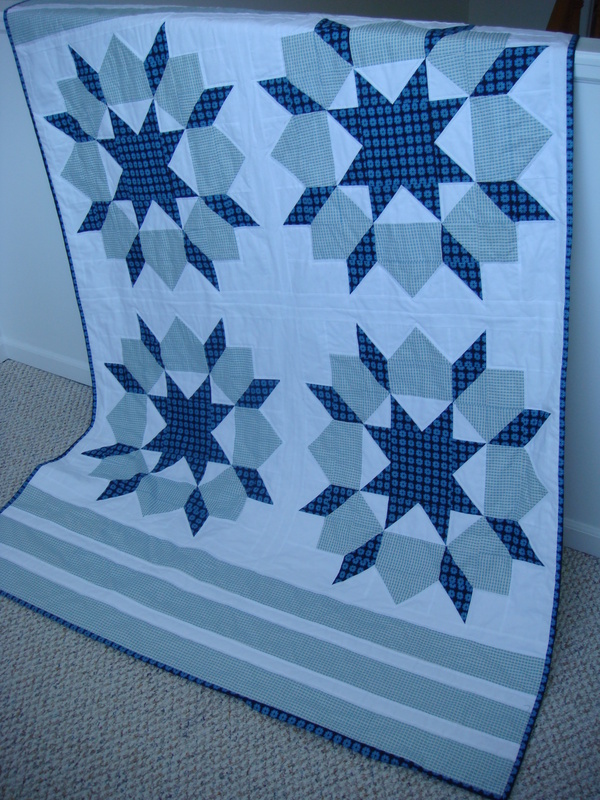 This entry was posted in Uncategorized, Your 1st quilt and tagged Binding. Bookmark the permalink. I agree! I really like this stage, too. Once I get the binding sewing on, I feel myself give a sigh of relief; it’s the part of the quilt that I can work on while I indulge in some television! this tutorial series is fantastic! great clear instructions and photos to go with. thank you very much! 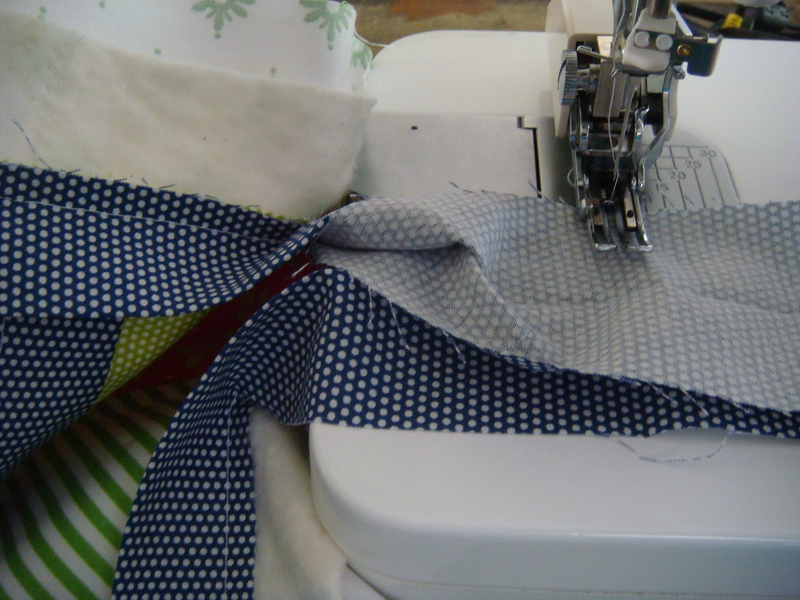 i am less afraid to try machine quilting and doing the binding now. This was VERY clear and helpful! Thank you!!! Sarah, this has been my 1st attempt to make a quilt. I found the best information and tutorials on you website. I have finished the quilt top, and now I’ve retread your tutorials on batting, backing, and border and feel confident enough to begin the next step. Thank you so much for your help!